A cave in the Mendip Hills in southwest England has been revealed as the earliest scientifically dated cemetery in Britain. 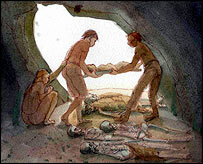 The site at Aveline's Hole, near Burrington Combe, contained human bone fragments that have now been confirmed to be between roughly 10,200 and 10,400 years old. The specimens - representing about 21 individuals - were originally removed from the cave in the early years of the 20th Century and were held in a museum in Bristol. There, the collection was largely destroyed in a World War II bombing raid. It is only recently that scientists have returned to the surviving bone and teeth samples to give them a proper assessment using modern methods. David Miles, Chief Archaeologist of English Heritage which commissioned the dating, said: "The dates show that some people in Britain were burying their dead in a cemetery in the early Mesolithic period 4,000 years earlier than had previously been thought. "Although late Mesolithic cemeteries have been found on the continent, none have been recognised over here." The old age of the specimens meant Aveline's Hole was of international significance, Dr Miles said. It would revise our ideas about the organisation of society in Mesolithic times, he added. A sealed cave at Aveline's Hole was first recorded in 1797, when there were reports of between 70 and 100 skeletons lying on the floor side by side. However, by 1914, when the University of Bristol Spelaeological Society (UBSS) began excavating the site, only the remains from the 21 individuals were found. Early reports described a "ceremonial burial" with a skeleton on a disused hearth, together with red ochre, animal teeth - some perforated as though for use as a necklace or amulet - and a set of fossil ammonites. The specimens were taken to Bristol, where they were displayed on the ground floor of the UBSS museum, only to suffer extensive bomb damage in November 1940. Most of the collection plus all the excavation records were destroyed. The new radiocarbon measurements were undertaken as part of a comprehensive re-analysis of the remaining specimens in a project headed by Dr Rick Schulting of Queen's University, Belfast. Dr Schulting said: "We know very little about Mesolithic society as few remains have been found that supply sufficient information. Aveline's Hole is giving us the opportunity to reconstruct something of the diet, health and life-style of these enigmatic people." Already it has been established that the Aveline's Hole people came from close by, based on the levels of strontium found in their remains and the local environment. The analysis has indicated that the adults in the group, which also included young children and two infants, were only about five feet tall and slightly built. They do not appear to have lived to a ripe old age, as few molars show the extreme wear to be expected from elderly hunter-gatherers' teeth. As well as signs of osteoarthritis in an elbow, scientists have spotted lines in teeth indicating repeated periods of poor nutrition or chronic illness in childhood. There is little evidence of fish in their diet - even fresh water varieties. Aveline's Hole would have been much further from the sea than it is now. Britain had not long been released from the grip of extensive ice cover. Although the world's oceans were rising, it is thought there was still a land corridor between the UK and France, and the local people would have been able to walk directly north, across what is now the Bristol Channel, to Wales.